Sometimes all you want is a fast and easy-to-sew project. 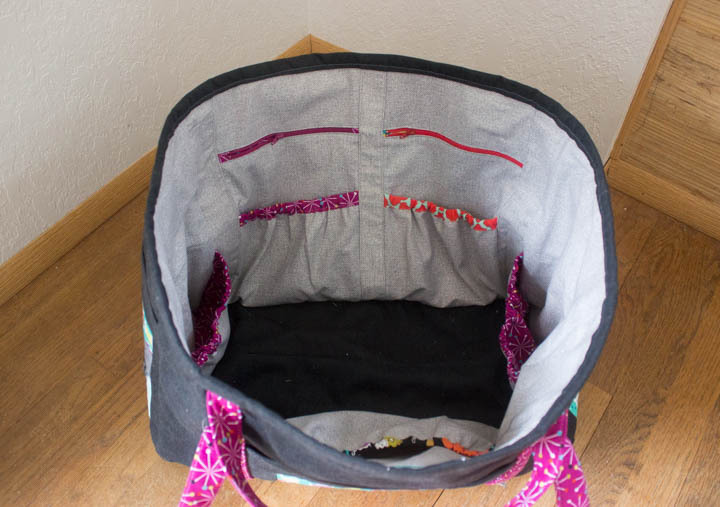 You might need to fill a “hole” in your wardrobe, or maybe you want to use up a fabric from your stash. 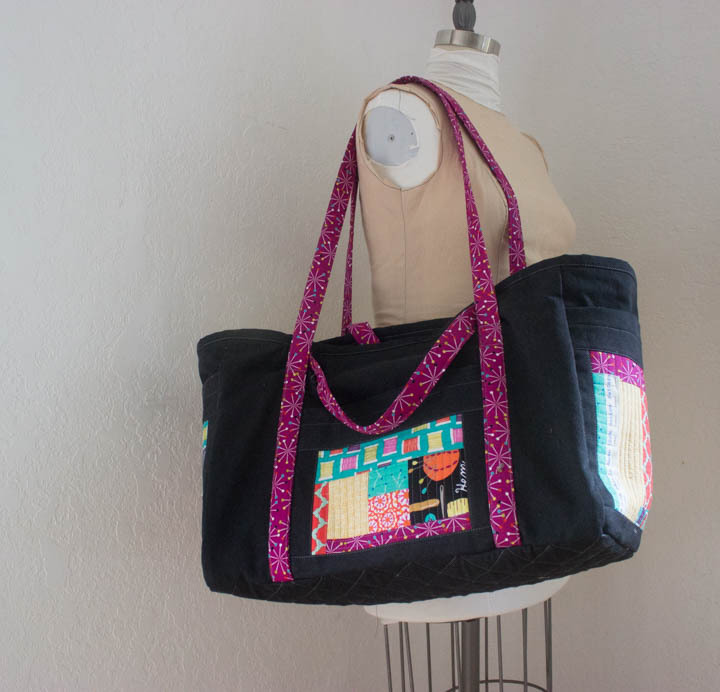 You could even be sick of fiddling with a complicated project that just won’t sew itself! 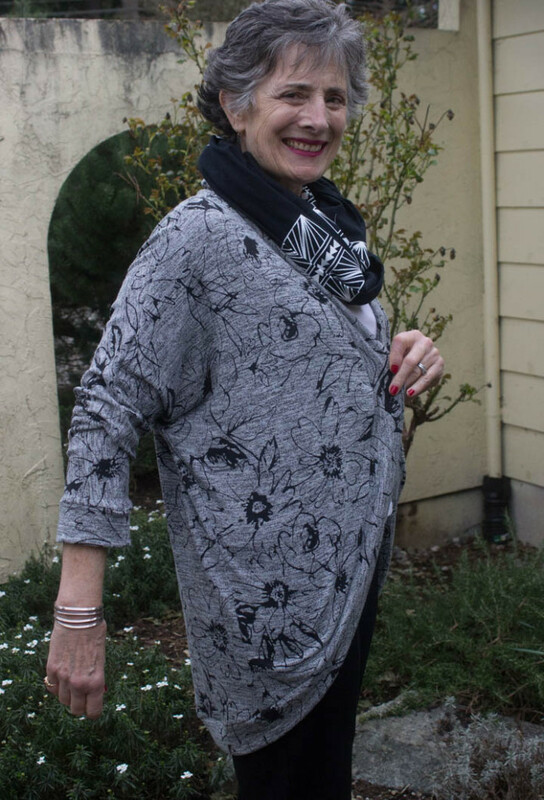 Enter Jalie Cocoon cardigan. Just 4 pattern pieces; front, back, sleeve cuff, and circular band. A few instructions that you barely need to reference (sew front to back at shoulder/sleeve seam, sew sleeve/side seam; apply cuffs, sew band pieces into a circle and attach to sweater) and this baby is done and done! Not even 1 hour of sewing time! Cocoon sweaters are “in” again this season, and for a good reason. They are comfy, can be made from a variety of knit fabrics, and the shape can be adjusted slightly to flatter most figures. Oh and yes, they are a very quick sew! 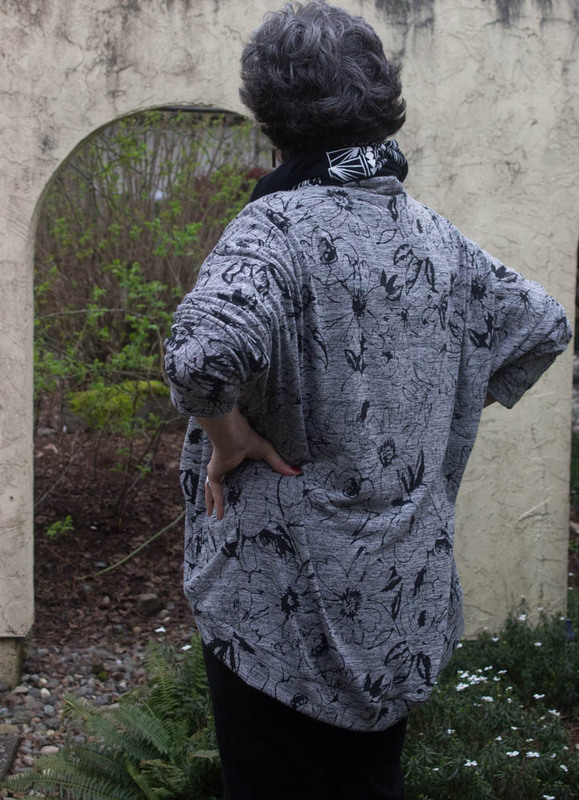 While I do definitely like cocoon sweaters, I am not a fan of the styles with wide, batwing-ish sleeves. Too.Much.Fabric. The slimmer silhouette of Jalie 3353 works just about perfectly for my design aesthetic. One thing. I did find the sleeves on this pattern to be a bit short and wide for my taste. After shooting these pix, I removed at least 3 inches from the lower sleeve circumference, and added a longer cuff to get the overall sleeve length I wanted. The sleeves was just too floppy, IMHO. 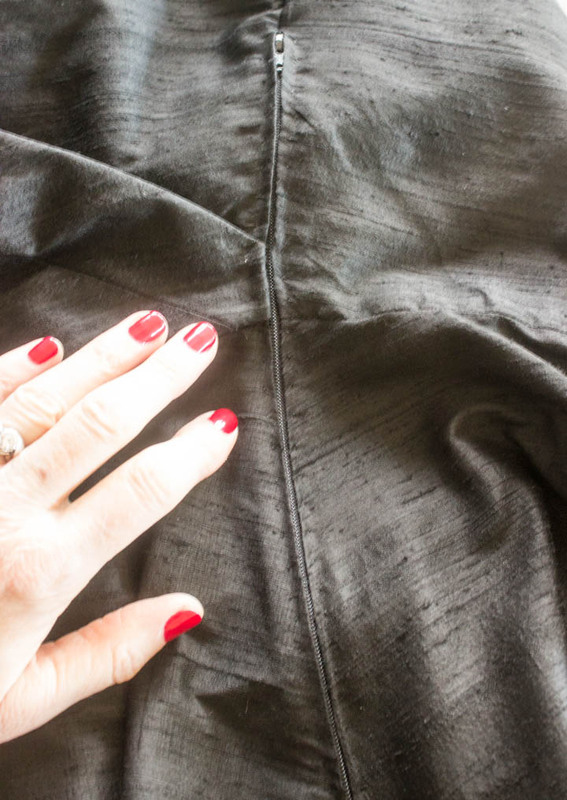 It is an easy pattern change – just remove an equal amount from the upper sleeve seam and the lower sleeve seam. I determined the amount to remove by basting first, trying on for fit, and then serging off the excess width. 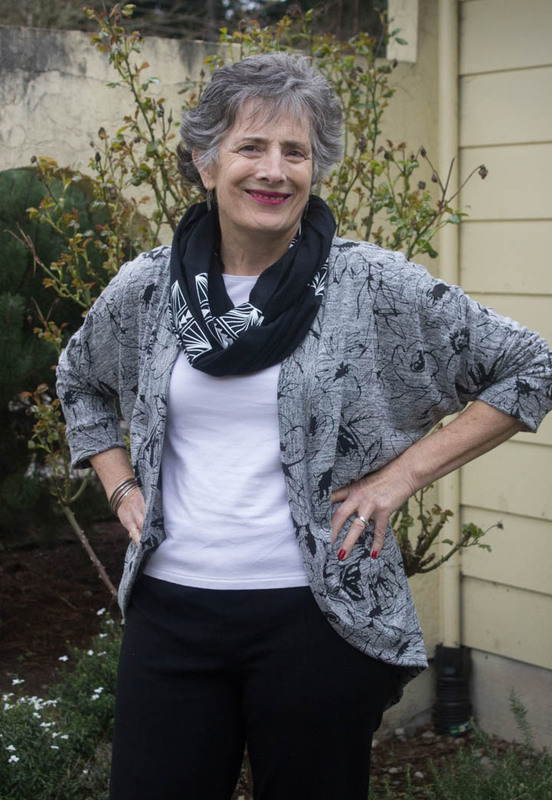 I plan to make this sweater again using a yummy, red bamboo sweater knit currently resting in my stash. 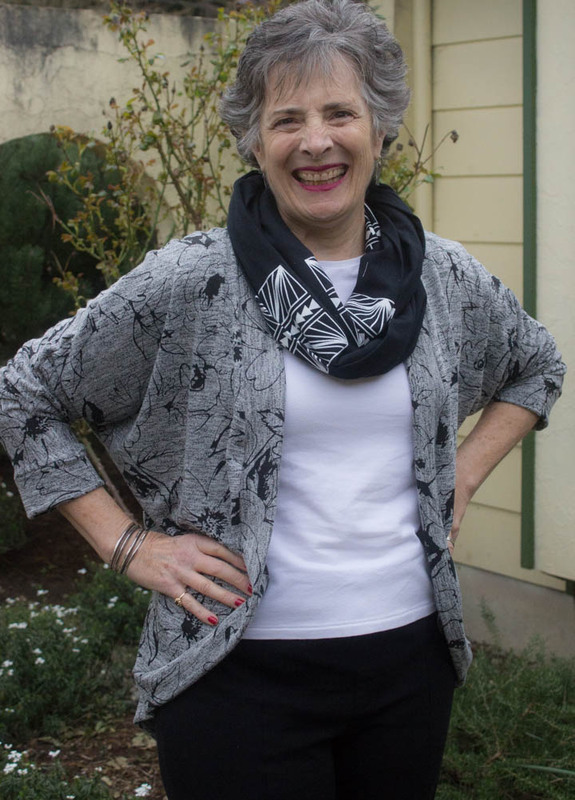 This pattern is a great topper for pants and a tee, and provides just the right amount of warmth. I think it is a keeper! What do you think of this silhouette? 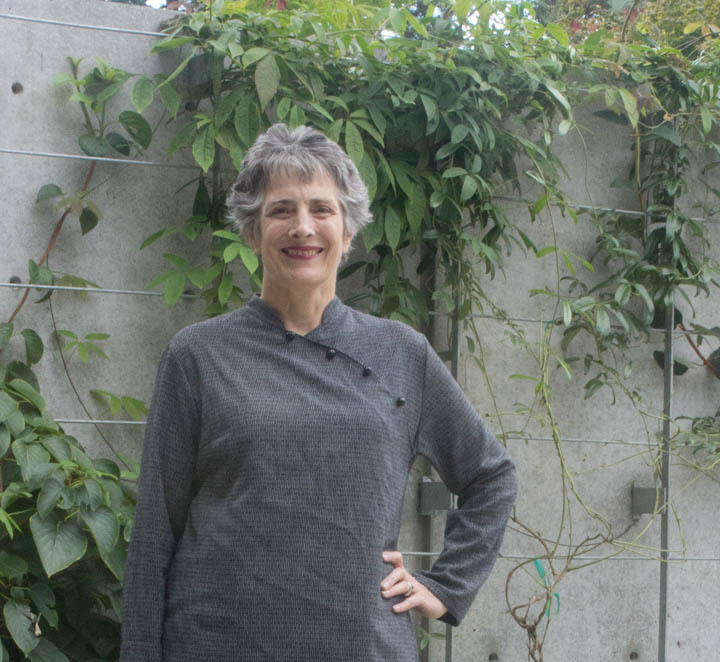 Have you ever tried wearing or making a cocoon-style sweater? There are times when a pattern just calls your name. I don’t really have that many occasions to wear a silk “party” dress. But at a recent ASG dinner we were hosting some lovely ladies from McCall’s Pattern Company, and had been asked to wear a garment made from any of the McCall’s family of patterns. 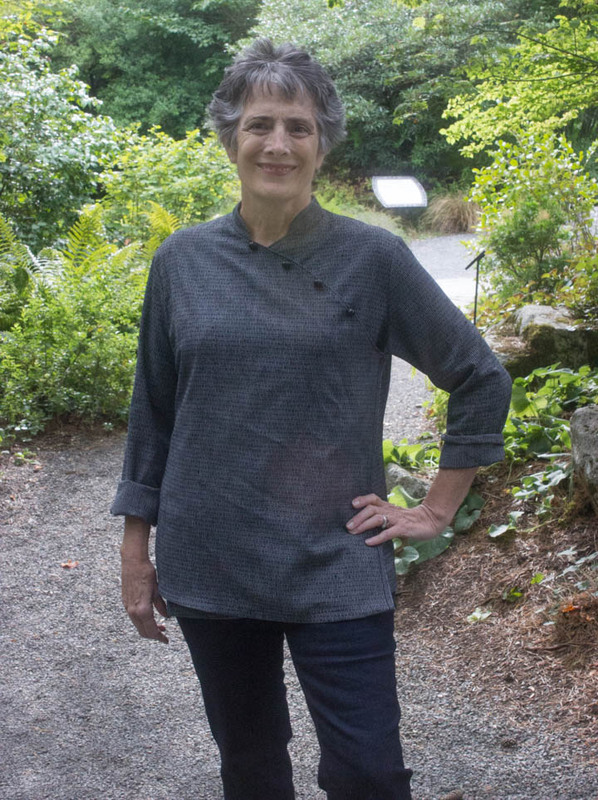 Vogue is usually my McCall’s pattern company of choice, and since I had the black silk dupioni, Bemberg lining, pattern, AND vintage mother-of-pearl belt buckle in my stash, how could I resist? This pattern is really an easy sew. I have only made one other vintage reproduction pattern, and found it to be easy to assemble as well. The one change I did make was to fully line the top, rather than applying facings. I decided not to line the skirt, because as usual I was short on construction time and needed to get.it.done. 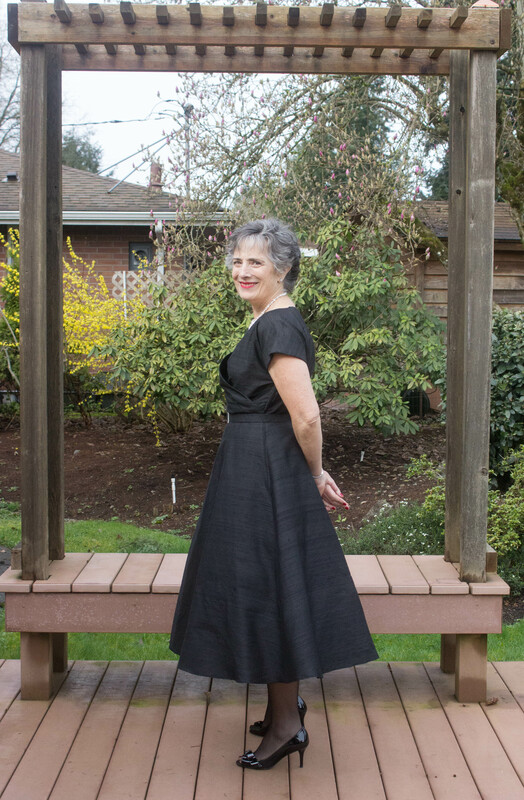 I may go back and add a skirt lining later, but those big ole almost-circle-skirts take a lot of fabric and I am not sure I want to use up my Bemberg lining stash for this dress. I hand-picked the zipper in place, mostly because I was terrified to machine stitch over the folds of the tuck on the bodice. That just seemed like a hot mess waiting to happen. With all the texture on silk dupioni no one could tell if my stitches are even and consistently placed or not. Winning! Love the sleeve gussets. A little fiddly to set in, but not that bad. Of course because I lined the bodice I got to do it 4 times instead of just 2. Serves me right, eh? The one fitting/wearing issue with this dress is keeping the upper front edges of the bodice laying flat and smooth. Part of this issue I probably created myself by pulling the stay tape a bit too tight. You know me – if a little is good, more is better, right? I added a small section of boning to each side after construction (stitched to the seam allowance), but I don’t think it helped too much. Maybe more boning? 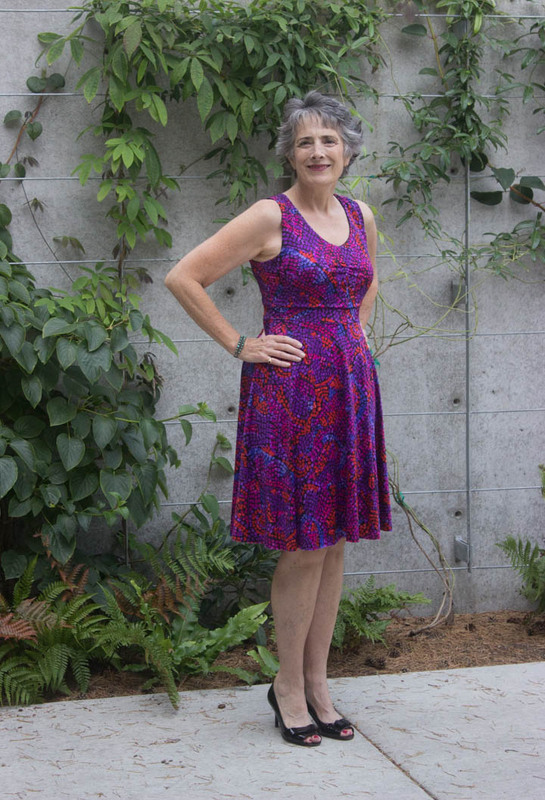 This is a good application for body tape, which I did wear at the Sew Expo dinner. I will try it once without tape, and see how annoying it is before attempting to redo the boning. Talk about fiddly! I would love to make it again in a light cotton voile for summer. A Liberty fabric would be gorgeous, but would cost a fortune to make up. Have you ever sewn a vintage or a vintage reproduction pattern? Do you consider “vintage” part of your style? I was over-the-moon excited to be included in the Sew, Mama, Sew Citronille pattern challenge, sponsored by Fiddlehead Artisan Supply. I first discovered these charming French patterns for children while traveling in Paris some years ago. Swoon! 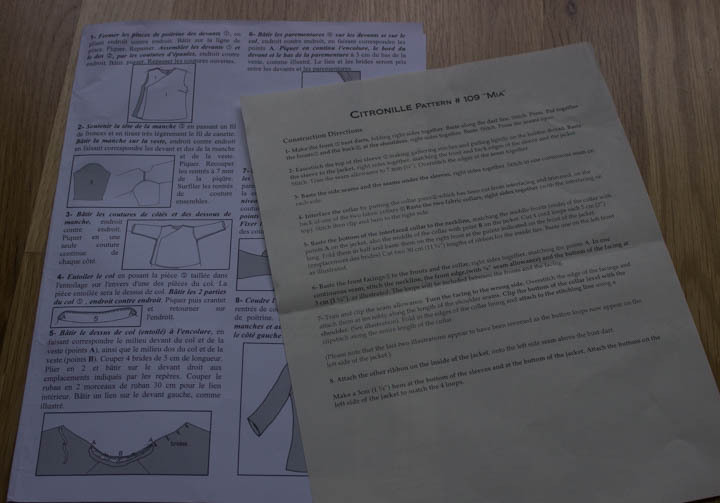 First off, a few things you should know.First, Citronille patterns are written in French. 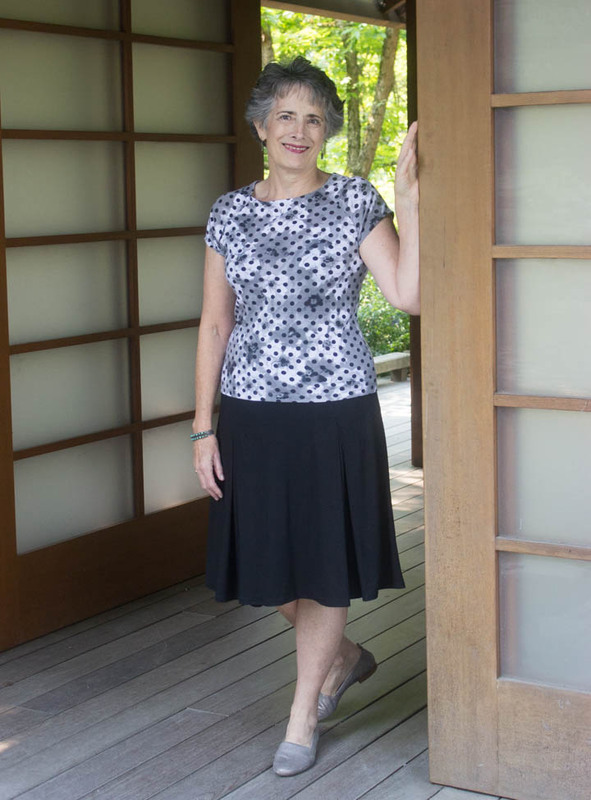 If you are not fluent (and I am not), Fiddlehead has done you a favor and provided a glossary of terms plus a translation of the pattern instructions so you can figure how to put these garments together. Thank you, Fiddlehead! Second, the instructions are rather minimalist. 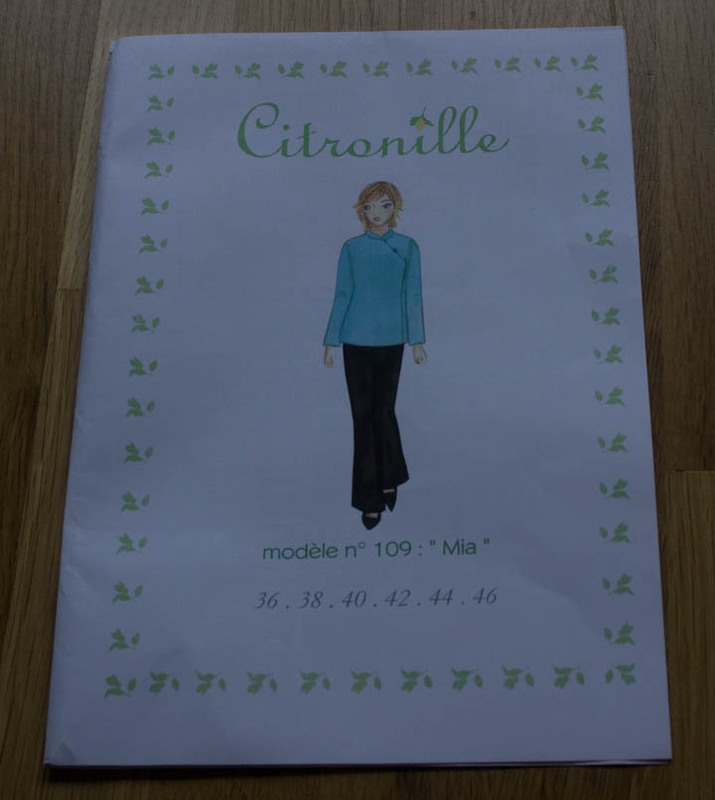 If you have ever sewn with Style Arc patterns, the “depth” of instructional information is similar for Citronille. If you are an absolute beginner, you might have a little trouble. The patterns themselves are simple with only a few pattern pieces, but the finishing details assume you have some sewing knowledge. Finally, there are no fitting alterations/adjustment lines included. No biggie for me, and you can (should?) get this information from fitting books anyway. Now, let’s talk about the Mia top specifically. I was very attracted to this style because I love anything asymmetrical. It is just an edgier, more interesting design line to my eye. Here are a few things I noticed when I started working with the pattern. I was very surprised to see the front dart was the same size for all pattern sizes. Generally, the larger the garment size the larger the dart size, so that set off a little alarm bell in my head. I decided to just go ahead and try it as drafted. The grainlines were marked on each pattern piece, but notching was almost non-existent. OK, I know where things are supposed to line up, so I could deal with that. The pattern included a front, back, sleeve, front facing, and collar pattern piece, but no back facing. OK, no biggie, I drafted a back facing pattern in about 2 minutes. The only pattern adjustments I made to the Mia top were for a forward shoulder and petite-ing above the waist, because I need those 2 adjustments on every pattern. Every.Single.One. Ready to cut out! Since there are only 5 (+ 1 back neck facing) pattern pieces, the cutting was fast and easy. I stitched the darts, then the shoulder seam, and then set in the sleeves. The instructions call for running an easing stitch first to help set the sleeve, but the Mia sleeve fits correctly into the armhole so I did not find this necessary. If this “no easing” technique is new to you, be sure to read over my How to Set in a Sleeve Without An Easing Stitch tutorial. When I went to stitch the side seams and sleeve seam (in one continuous seam), I discovered a pretty major drafting flaw. The front and back sides do not match up. By a lot; specifically 3/4 of an inch. “Walking” the seamlines to ensure the lengths match is Pattern Drafting 101, so I consider this to be a major AND super-easy-to-correct pattern flaw that Citronille absolutely should correct. At this point, all I could do to my top was shorten the back to match the front. 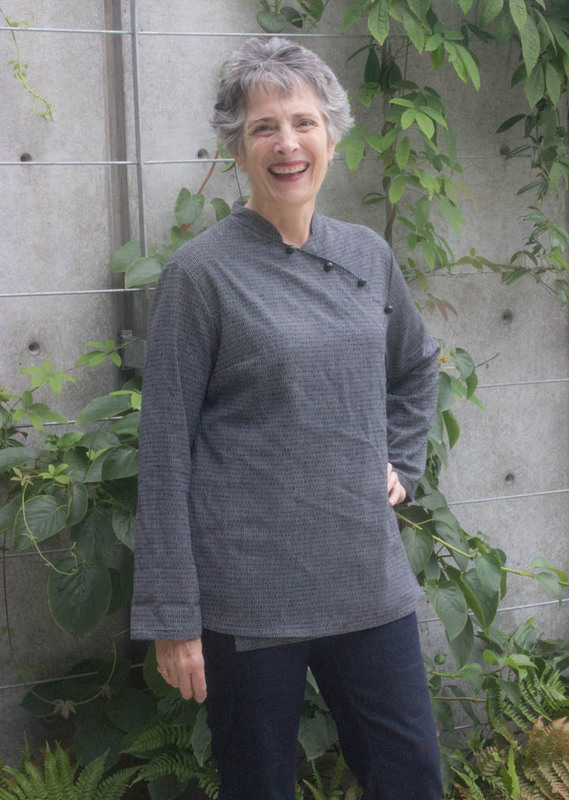 Depending on your preferred tunic length, you may prefer to extend the front and front facing pattern pieces to match the back length. At any rate, be aware of this pattern flaw! The rest of the pattern went together fine. I did not follow the pattern instructions regarding the collar + facing technique, because I detest the no-back-neck-facing-kludgey-collar-system. Truly. I hate it and never do the sew-one-collar-layer-then-stuff-the-seam-allowance-inside-and-hand-sew-the-opening-closed method. Far cleaner and easier to sew by including a back neck facing. Two minutes of pattern drafting solves this issue, and is well worth it IMHO. The rest of the construction was easy. All in all, this top sewed up very quickly. Now let’s talk about fit and design. Despite my concern over the dart drafting, the Mia Top fit me very nicely, especially though the shoulders and armhole. There is good arm movement in this shirt, which is important in a woven garment! I think it fits well thru the bustline, but just barely. So if you are bigger than a C cup, beware. The fit through the waist and hip area was also just fine. As for design, on my body I think it is just OK. It is a little too shapeless to be really flattering for me. Rolling the sleeves up helps, I think. Note that IMHO the overlap on the fronts is very odd; the extension is completely across the entire shirt front. This means that you are attempting to tie/button/snap the garment together in your armpit area. And just for the record, that is darn hard to do. The Mia Top would be much more wearable from my standpoint if it wasn’t so irritating to get into/close up properly, and reducing the front overlap would easily solve this issue. Despite the fact I think this top is a little “meh” on me, I definitely plan to sew some of the Citronille children’s designs. Maybe it was my fabric choice, or maybe they do not design for my body type. 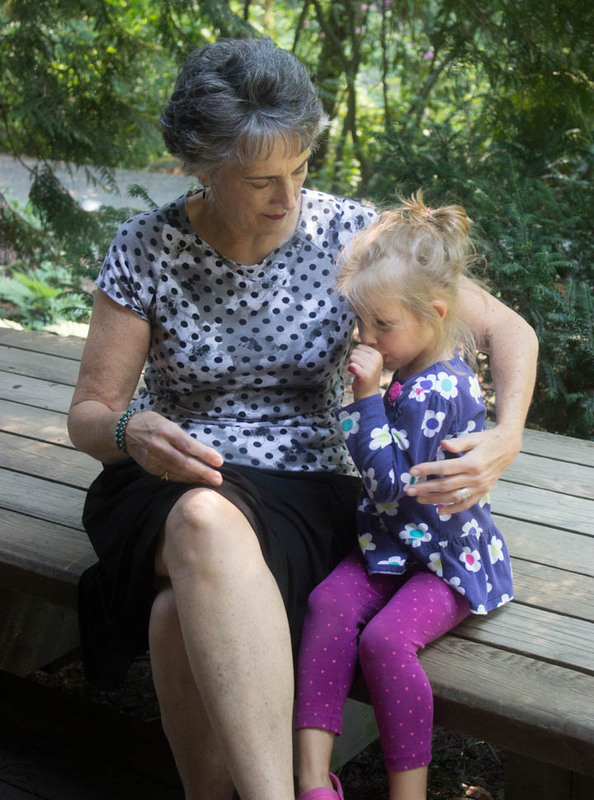 At any rate, I definitely plan to sew up some of their children’s patterns because I love, love, love many of their designs and my darling granddaughter needs a few of them in her wardrobe. 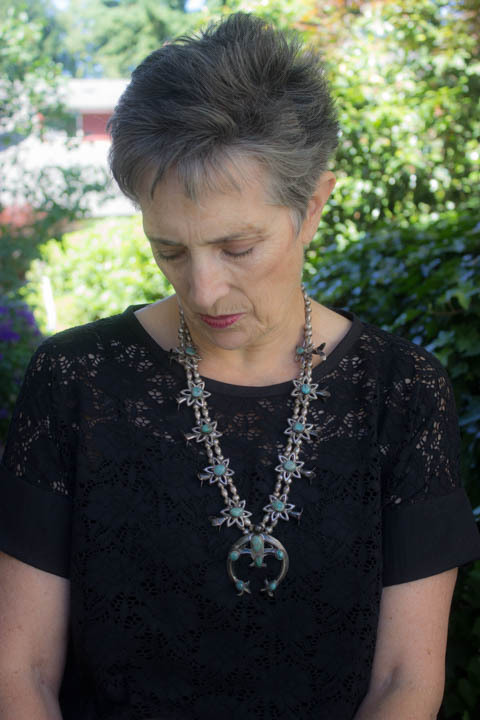 Be sure to check out the beautiful things sewn up by the other bloggers in this challenge, who have all been posting this week—you might just fall in love with Citronille designs, too. 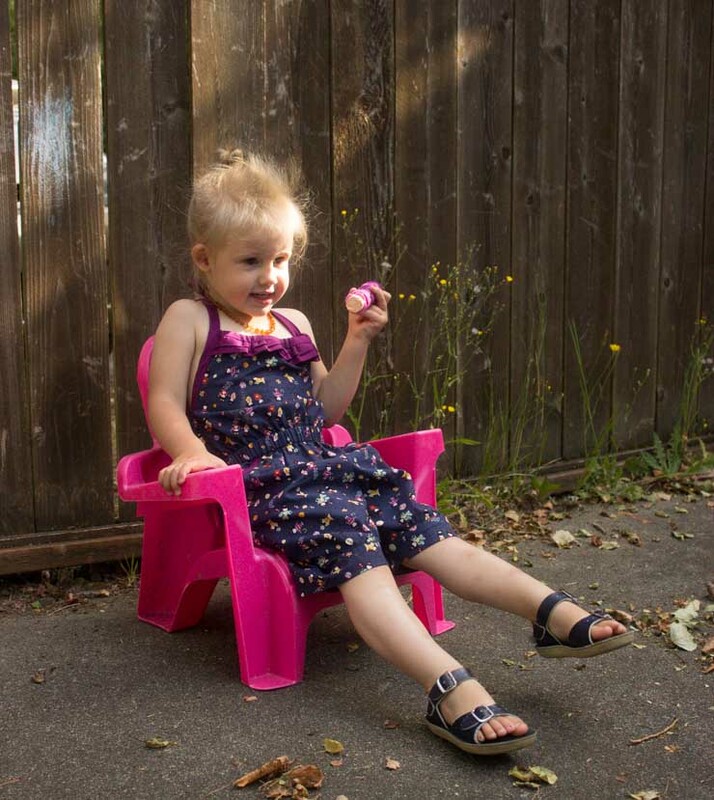 And don’t forget to enter to win a free Citronille pattern at Sew, Mama, Sew next week! It’s no secret; I love Itch to Stitch patterns! 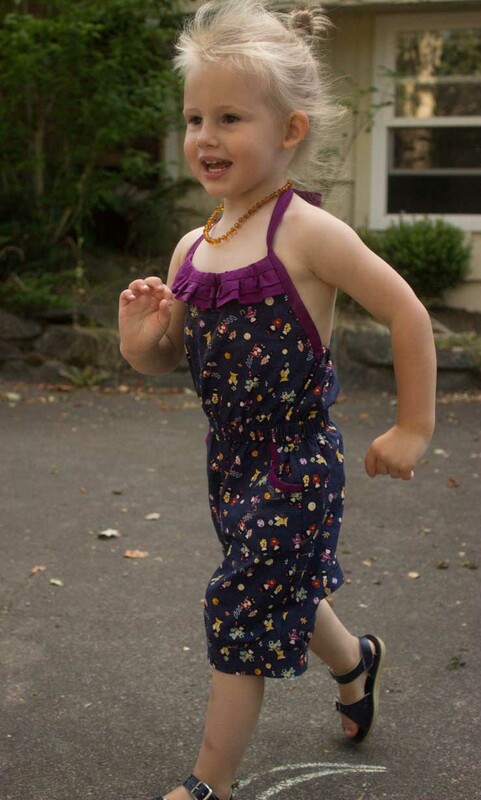 I was lucky enough to help test her latest design, the Davina dress. 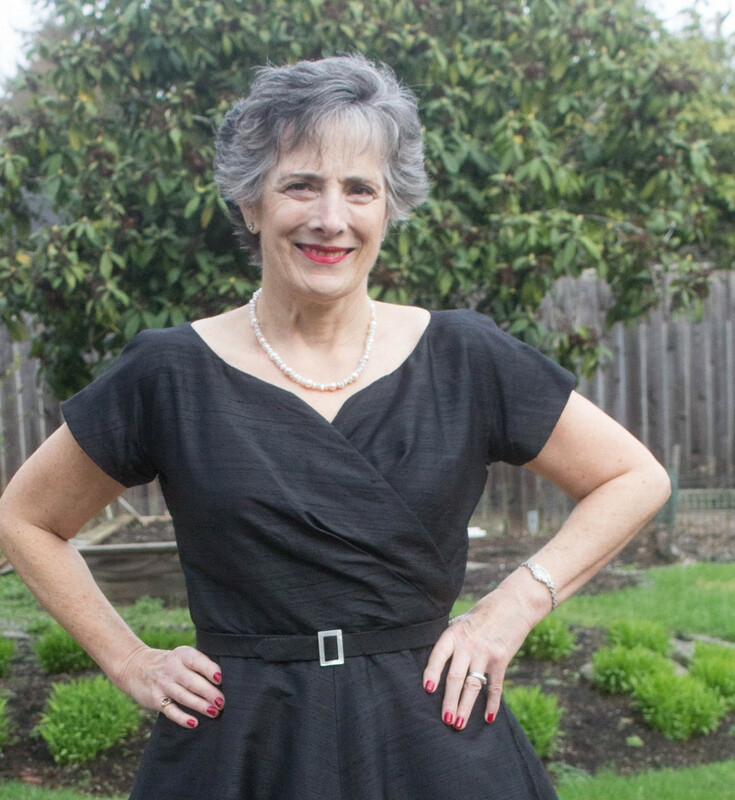 Pretty, feminine, classic, great fit—she pretty much hit all my buttons. I sewed up my version in an ITY knit from my stash. This pattern requires a knit with a high stretch factor (at least 75%), and great recovery. This pattern is extremely fitted thru the bodice, so if you decide to use a fabric with a lower stretch factor you really should go up a size. 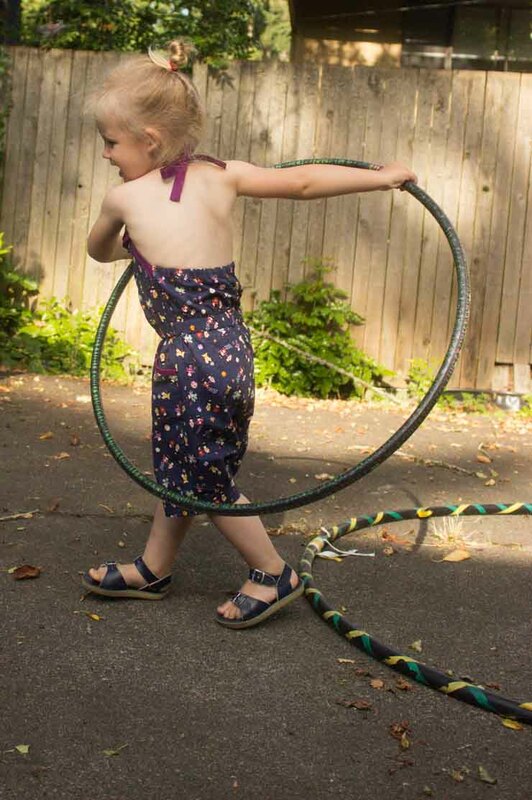 Such a great, twirly, half-circle skirt. Love, love, love! There are loads of sleeve length options, and when I originally sewed this I tried out the medium short sleeve. Notice my version as pictured has no sleeves—for 2 reasons. 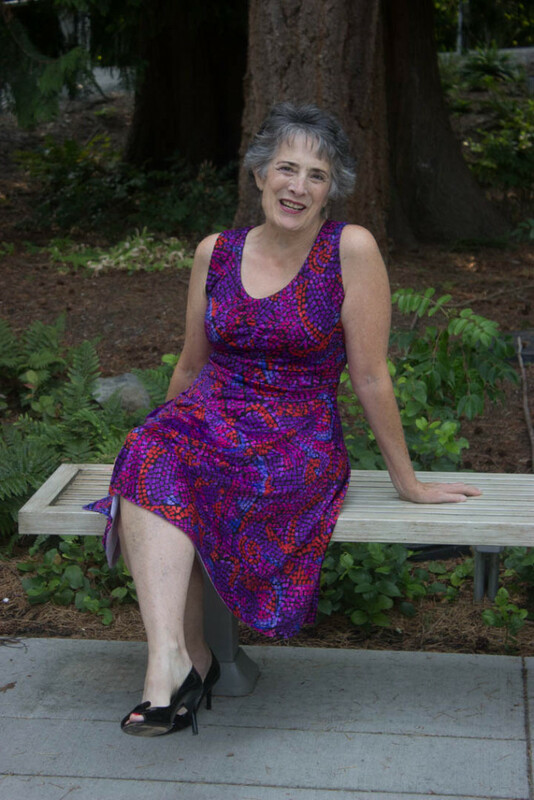 One, sleeveless knit dresses are more practical for me, since I find them more comfortable with a cardi over a bare arm rather than wrestling the sweater on top of sleeves. Two, the one thing I wasn’t crazy about on this pattern was the armhole fit when the sleeve was inserted. 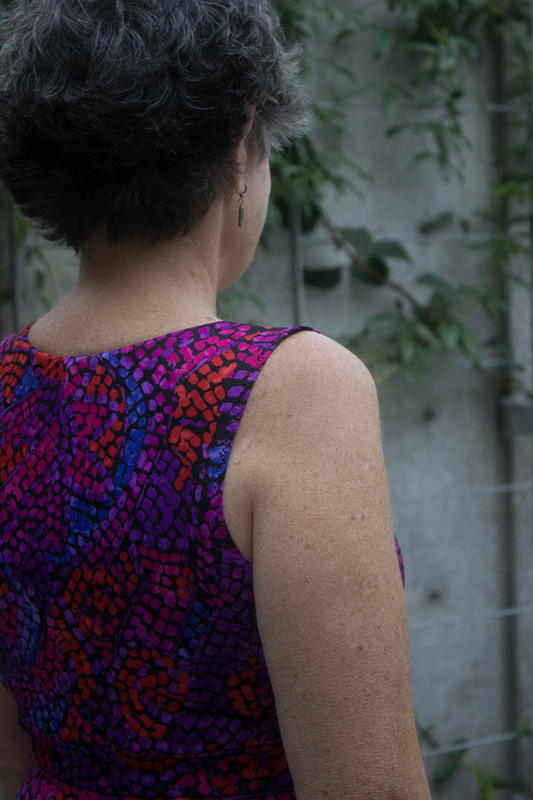 Maybe you can see that the armhole does not sit directly over the shoulder line. Super pretty design line for a sleeveless dress, but not so great IMHO with a sleeve. 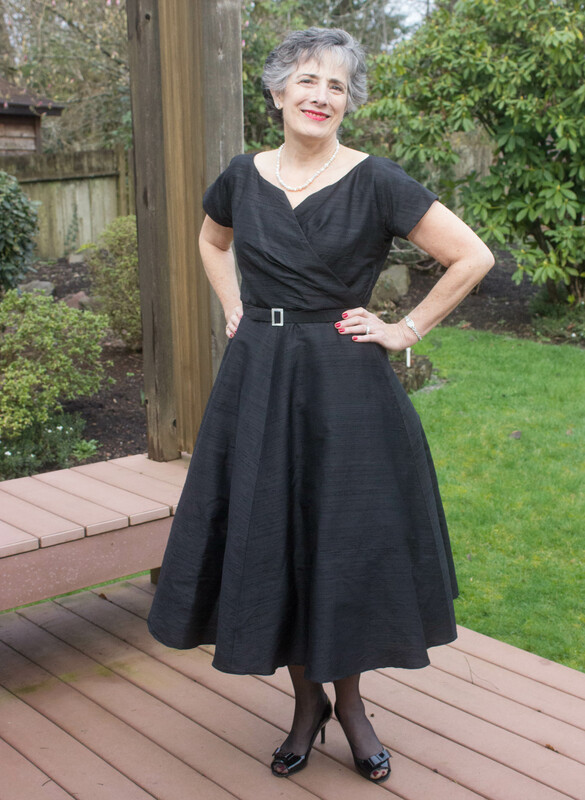 I do have fairly broad shoulders, so maybe it is my personal fitting issue, but if you make the Davina Dress (and I hope you do! ), this is an area to pay attention to. 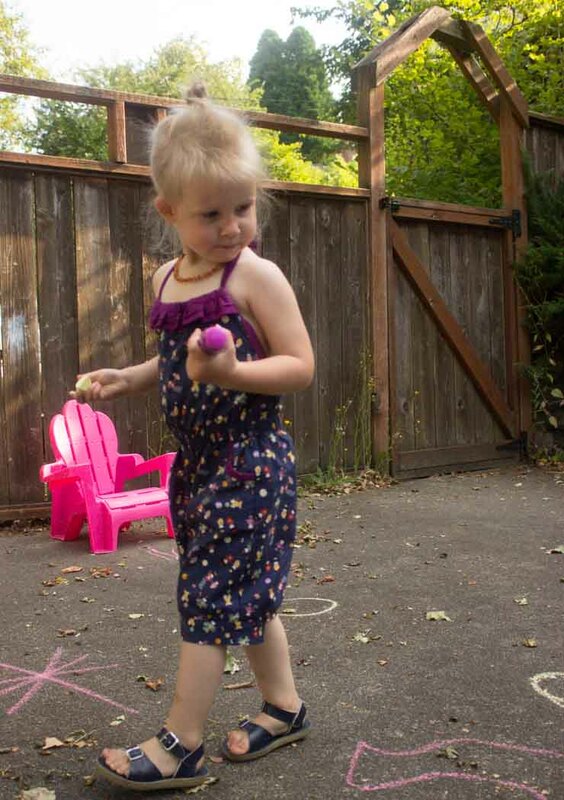 I love this dress so much I plan on making another one very soon, in a solid jersey knit. The pretty gathers on the front bodice don’t show up well in my print version, and that + the circle skirt are my two favorite features of this pattern. 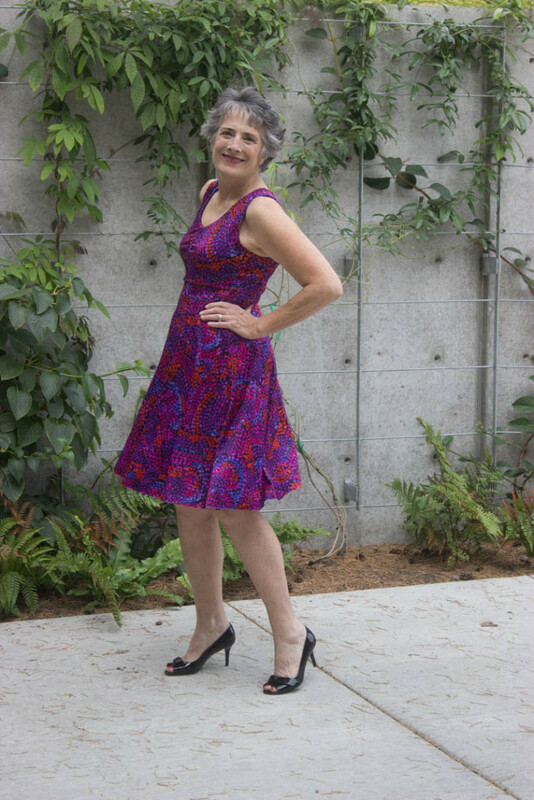 Right now you can buy the Davina Dress for 20% off, + also enter the raffle on Kennis’ web site to win a free copy of this pattern. 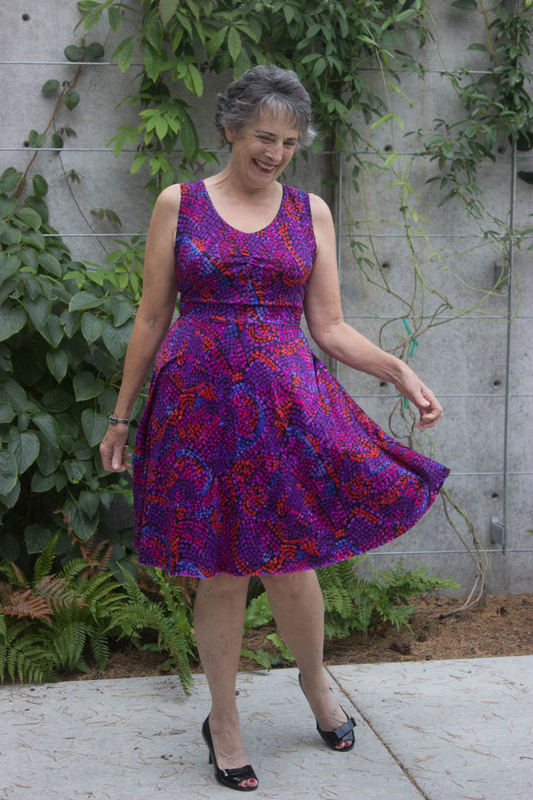 If you are in the market for a fresh, feminine new dress pattern (duh, who isn’t?? ), then I hope you give the Davina a try. I’m pretty sure you’ll love it, too! 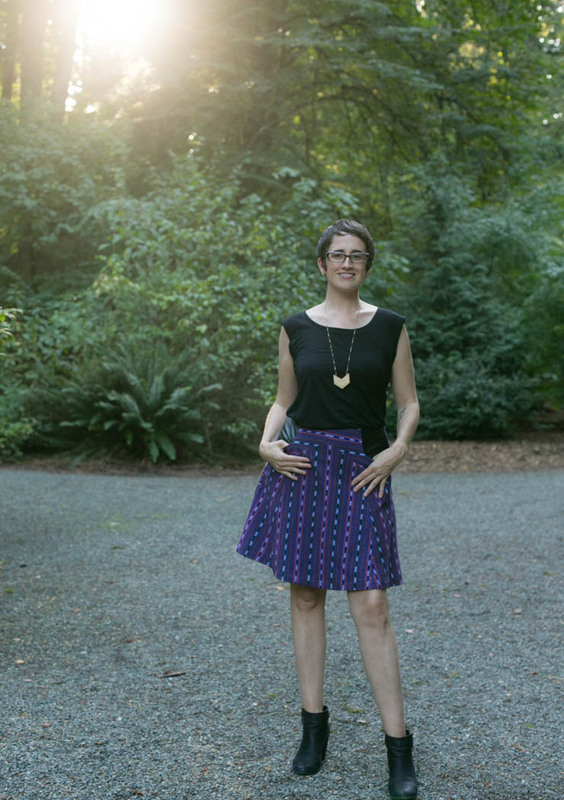 What’s not to love about Style Arc’s Allison Skirt? 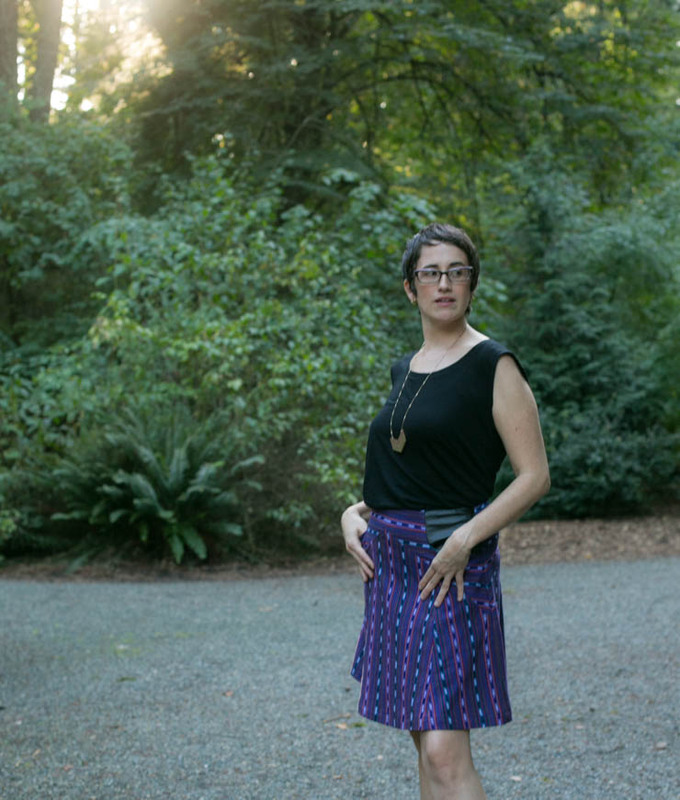 I made this skirt up in a cotton/lycra knit I had in my stash. Double win! Used a pattern + fabric from my stash! 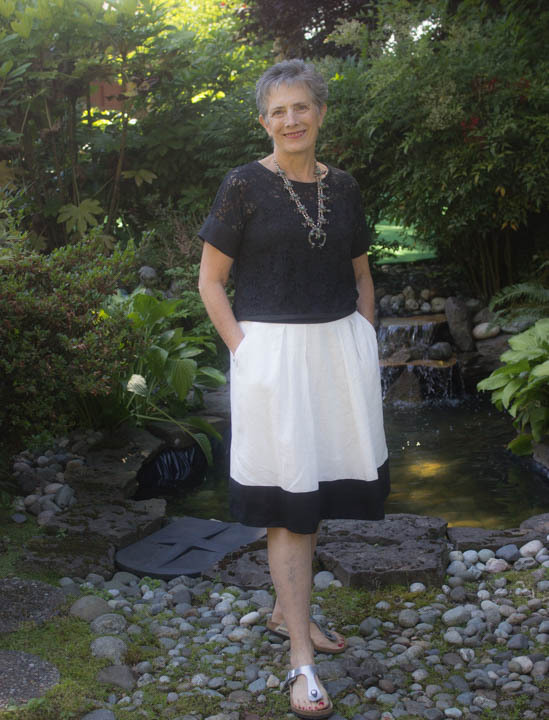 There are 2 inverted box pleats in the front and the back, so another bonus: easy dressing because there is no difference between the front and back side of the skirt! 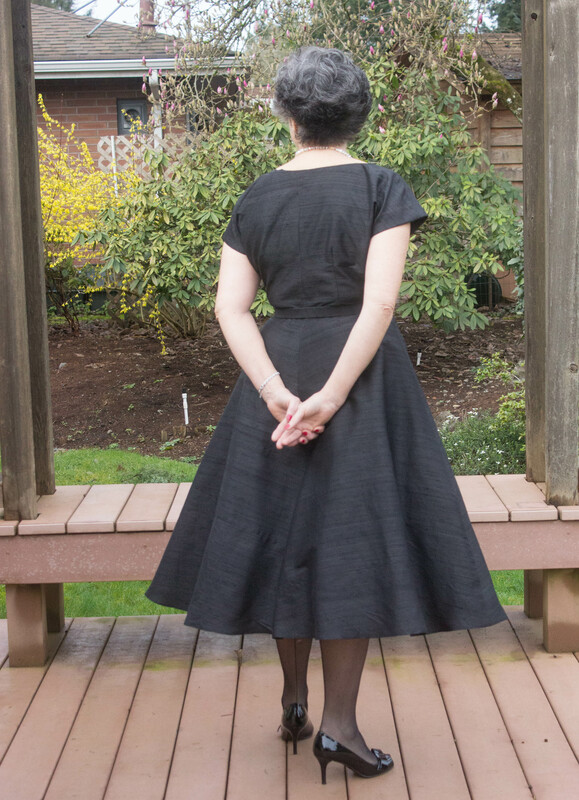 My one reservation is the weight of the fabric + the topstitching that secures the pleats in place. If you have not ever ordered Style Arc paper patterns from Australia, they include actual fabric swatches glued to their patterns, so you can tell exactly what fabrics they recommend. My fabric is a dead ringer for their sample swatch. But. Those pleats. 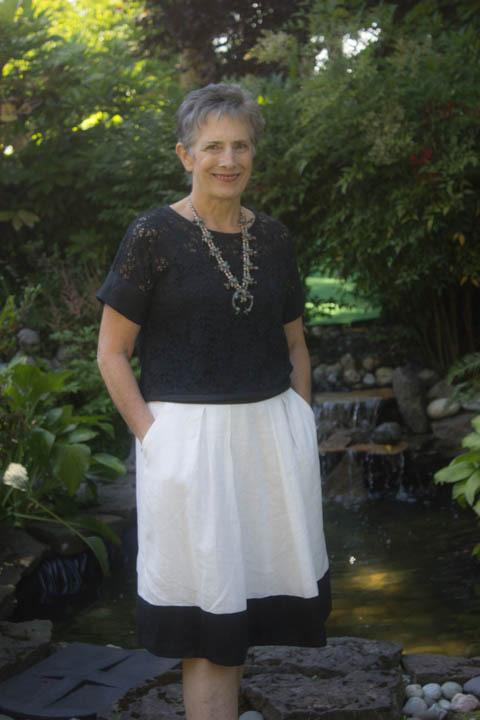 I feel like the weight of the pleat, stitched down to that pretty flimsy knit…..I dunno. Seems like an opportunity for a big ole hole to develop, right? 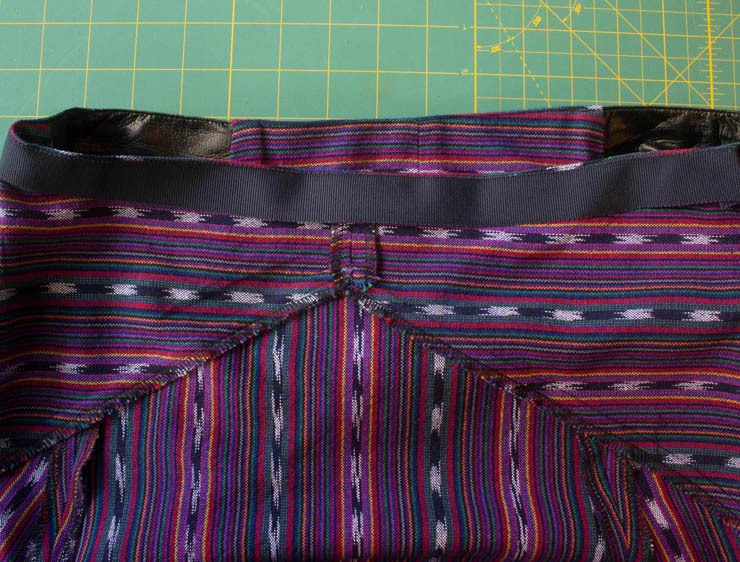 I will definitely make this skirt again, but I plan to stabilize the WS of the skirt front and back with a fusible stay tape before adding the final topstitching. Since I did not have this wonderful foresight on version #1, at this point fusing a bit of stay tape at the ends of the “V” just *might* help prevent a disaster. I also might try a light-weight ponte, so the skirt has a bit more stability/structure. 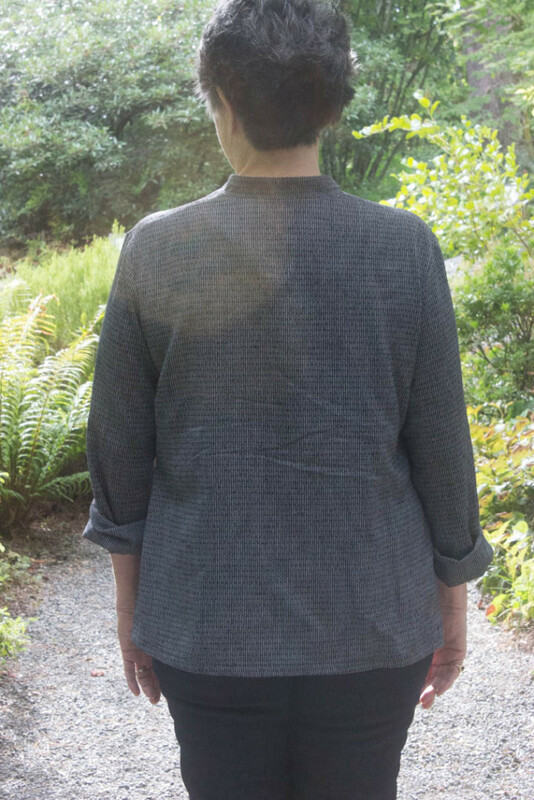 I am planning to make a track-style jacket out of ponte in the near future, so if I can remember I will experiment with the scraps to see how pleats will behave in that fabric. Too thin, too bulky, always looking for that “just right” fabric! This skirt will definitely become a basic in my wardrobe. I have about 10 tanks and T’s that will go perfectly with this skirt, and plan to give it a test drive on my upcoming trip to Italy. What about you? Have you ever sewn a Style Arc design? 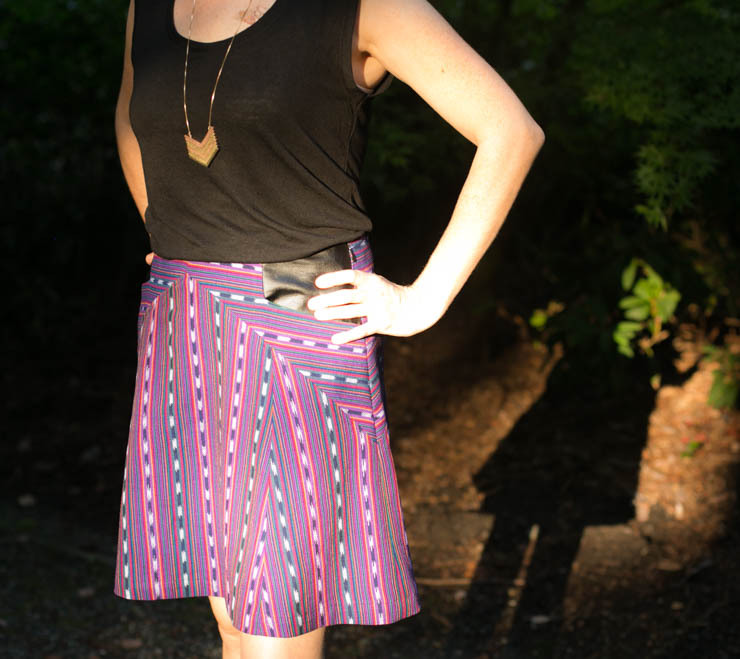 Have you tried the Allison skirt? What is on your sewing machine right now? 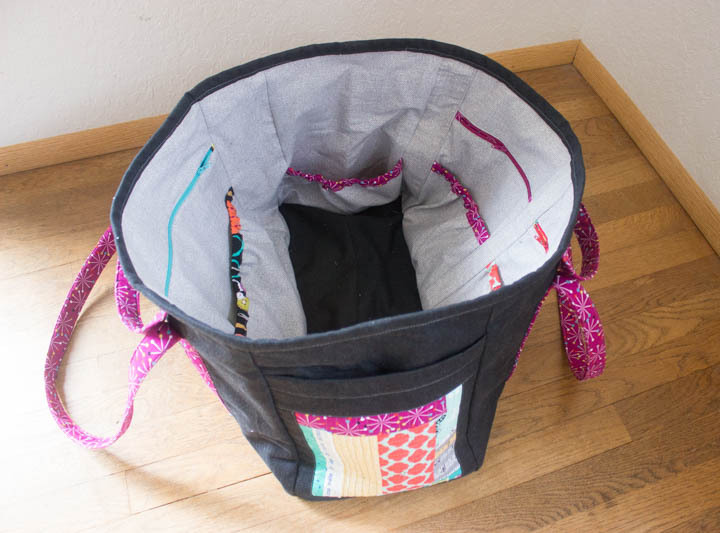 My version of the massive Sewing Circle Tote bag is finally done. Let’s be clear: there will not be a repeat performance. Way.Too.Much.Work. I already bitchedaired some feelings about this bag in a previous post, but I have more to add now. Sometimes we sew things for reasons that cannot be explained. Especially to husbands, friends, and frequently even to ourselves. It SEEMS like a good idea. 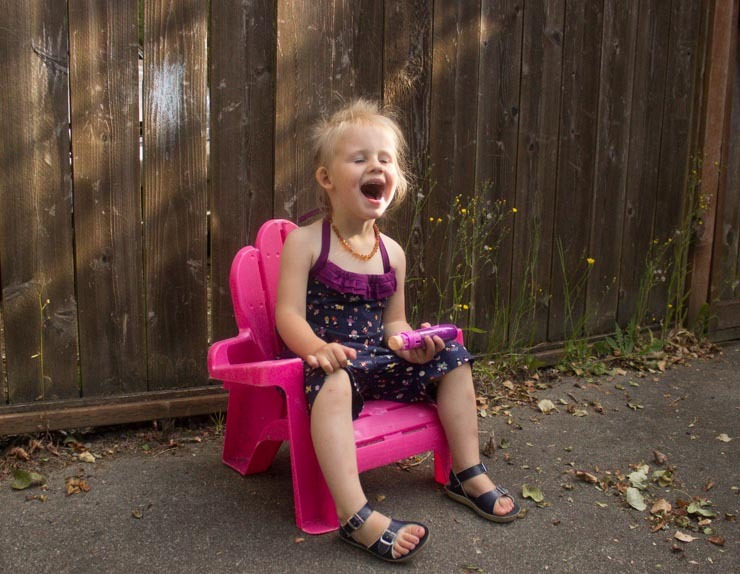 It WILL be cute, or useful, or possibly even perfectly suited to the task. As for construction and drafting, I had some issues that were irritating. The “large pocket” side of the lining (on the left in the image above) was not the same length as the opposite “small pockets” side of the lining. It was enough off that I had to do some ripping and re-stitch. I broke 2 needles and bent a third getting the lining attached to the exterior bag. If step number 82 (where the lining bottom is sewn to the bag bottom) had read “Stitch the lining to the exterior only between the handles” instead of “It doesn’t have to be pretty” I don’t think any needles would have been harmed. And extending the short handles 1 inch above the upper edge of the bag (step 85) is a complete waste of time, as I ended up cutting them even with the bag edge anyway. I am also not a fan of Elizabeth’s method of making her pockets. 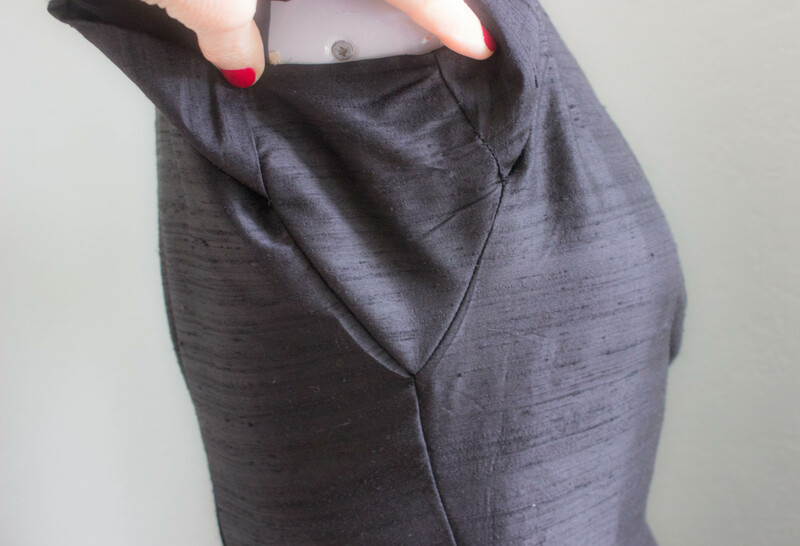 It works, but in general I prefer seaming + pressing over pressing + topstitching in place. My 2 cents on that. Have you made anything recently that exceeded the enjoyment:effort ratio? Tell me your story! 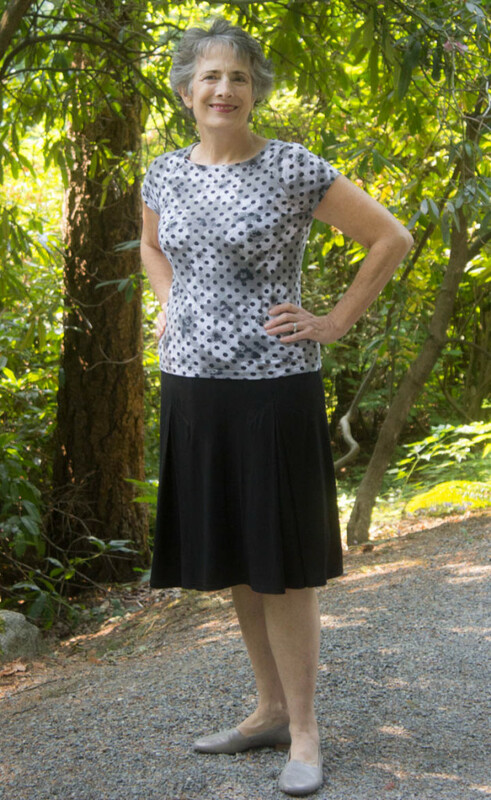 Snapdragon Studios asked me to review their Weekend Rambler Skirt pattern recently, and I decided this was a great opportunity to make a cute skirt for my DD to wear to work. 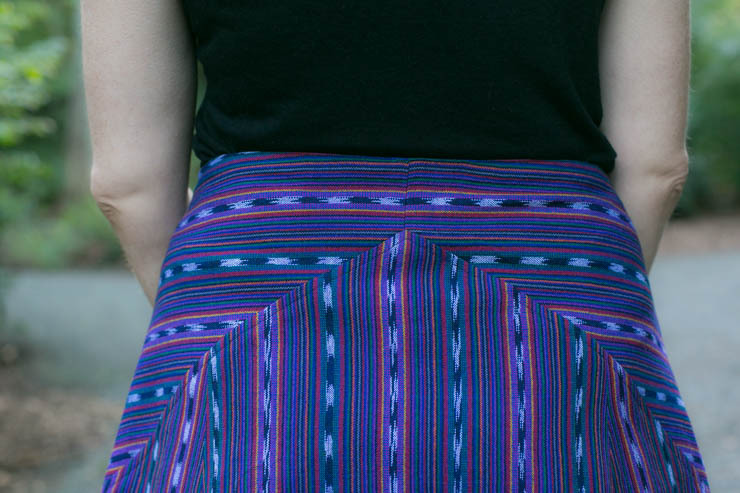 She selected a purple Guatemalean ikat cotton from my stash, which was a nice weight for the skirt. The pattern suggests cotton, linen, wool or corduroy, and I think any of those would work equally well, as long as the wool was fairly lightweight. I constructed the pattern as designed, with one exception. 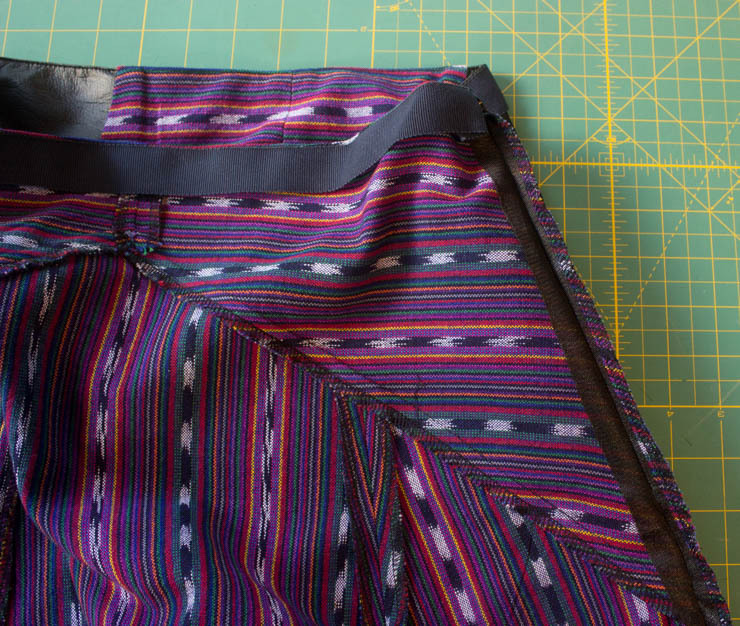 I used a Petersham ribbon to finish the waistband edge, rather than the facing that was provided in the pattern. No real reason, I just thought this finish treatment would be simple and a bit quicker to construct than a waistband facing. I also serged all the seams as the fabric was on the ravelly side. 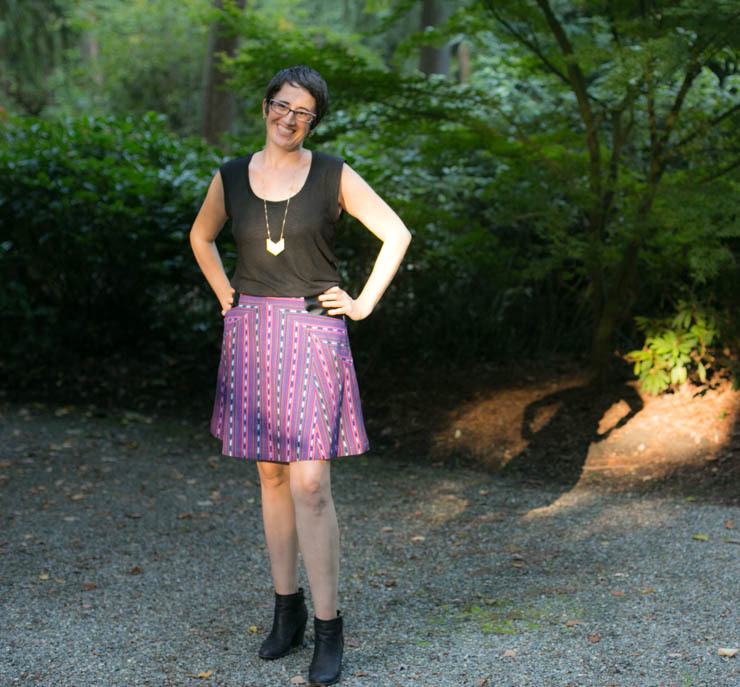 Cute, fresh, and modern-looking skirt design. 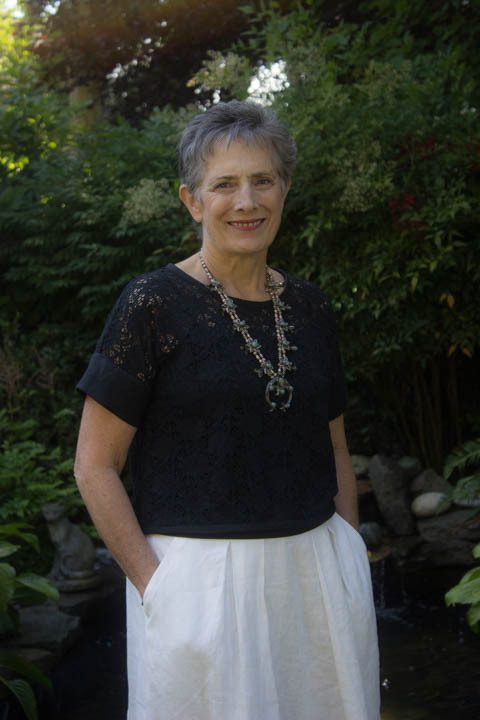 With the interesting yoke and skirt seamlines there is plenty of opportunity to create a unique garment. Since I used a stripey, ikat fabric, I was able to place the yokes on the crossgrain to create some visual interest. My my DD requested some leather accents too, so I used a faux leather fabric for the pocket, and she ended up loving the finished skirt. I agree with her—I think my version definitely turned out cute! The Weekend Rambler is designed to sit below your natural waist, and the suggestion for a “waist fitted skirt” is to select a smaller size. Hmmm. My very subjective reason this pattern rated a B for design is because I personally really dislike skirts that sit below the natural waist—they slither all around my body—and that just drives me nuts. 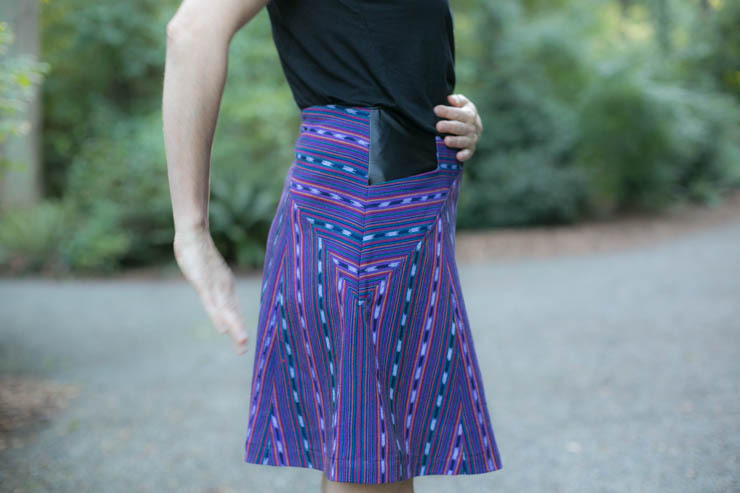 A lower waistline is OK in pants (for obvious reasons), but I think it works less well in a skirt. Also, there are no darts to improve/fiddle with the waistline fit of this skirt. The shaping is handled by pushing the darts into the yoke, but a “real” dart would help those who have more differentiation between waist and hip circumferences. All was well. I think PDF downloads are very successful for simpler patterns such as this. The less assembly/aligning the better, I say! I thought the button alignment mark was a cute touch, although on a download with more sheets of paper to contend with some kind of numbering scheme is helpful to make sure you are matching pages correctly. I had no problems with this pattern, though. Overall this pattern fit together well. The one exception was the pocket area. In the above image the pattern pieces are layered with the pocket on the mat, then the front yoke in the middle, and finally the back yoke on top. You can see the front yoke (middle pattern piece) is missing an alignment notch, and I also found the drafting to be slightly off in this area. The pocket and front yoke don’t line up perfectly after construction with the back yoke; although some of the extra length on the side of front yoke is handled during construction by the pocket lining seam. The discrepancy is not large, but I did have to do a little fiddling to get this part of the skirt lined up and looking smooth. Probably didn’t help that I was trying to match the stripes too. With the one exception noted above, each pattern piece fit properly to its intended mate. I only have a sample of 1, but the basic fit dimensions of this pattern were pretty good. 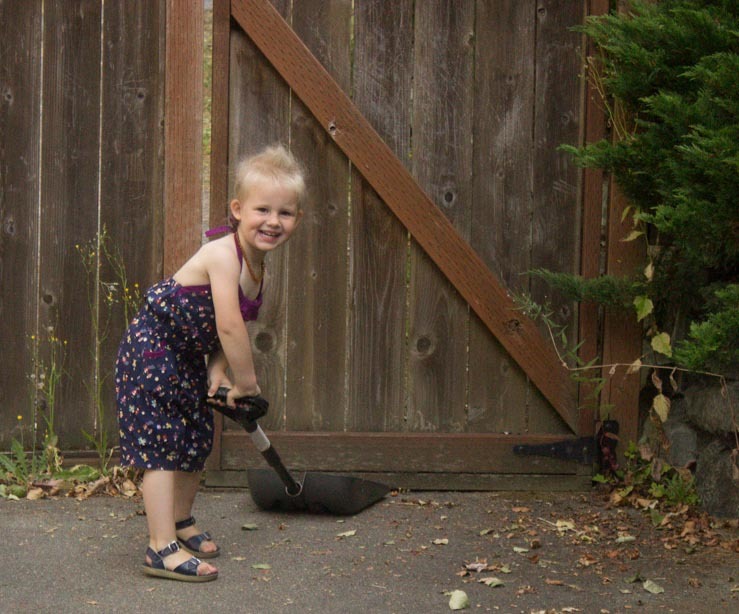 I used the size small which corresponded best to my daughter’s measurements, and graded the waist just slightly larger. I could have done a muslin and fiddled around to get a slightly better fit for her body shape, but in general the fit worked out quite well. Sigh. 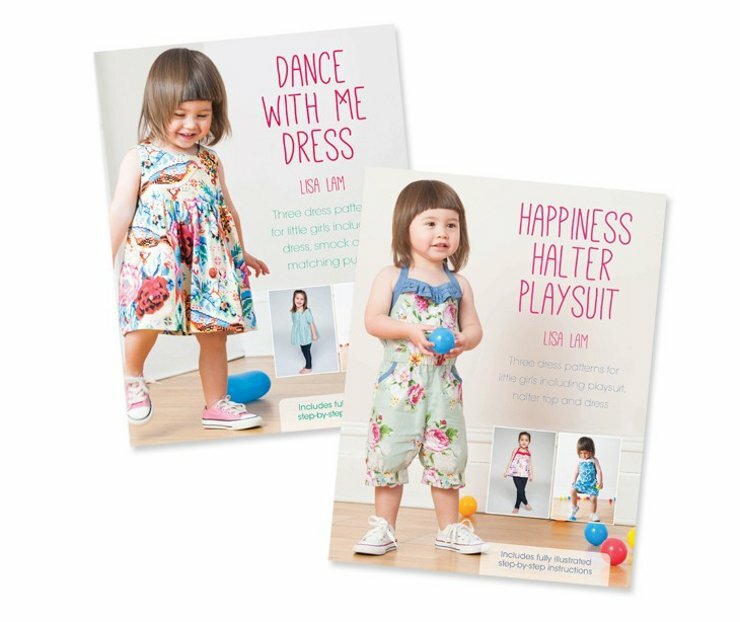 Many indie pattern makers today write their instructions in a conversational tone, rather than a more technical, instructional format. Personally, this drives me batty. Too.Many.Words. Small sentences. Short words. Bulleted lists. Numbered lists. It is all about clarity. Many less experienced sewists seem to prefer more words, but IMHO it just obscures the critical information. My ideal pattern instructions would be a simple numbered list of steps/short instructions for the experienced sewists, and possibly accompanied by a “wordier” set for those with less sewing experience. That should keep everyonemore people happy, right? I like this skirt pattern, and think it has some interesting design lines to “brighten up” the A-line skirt silhouette. 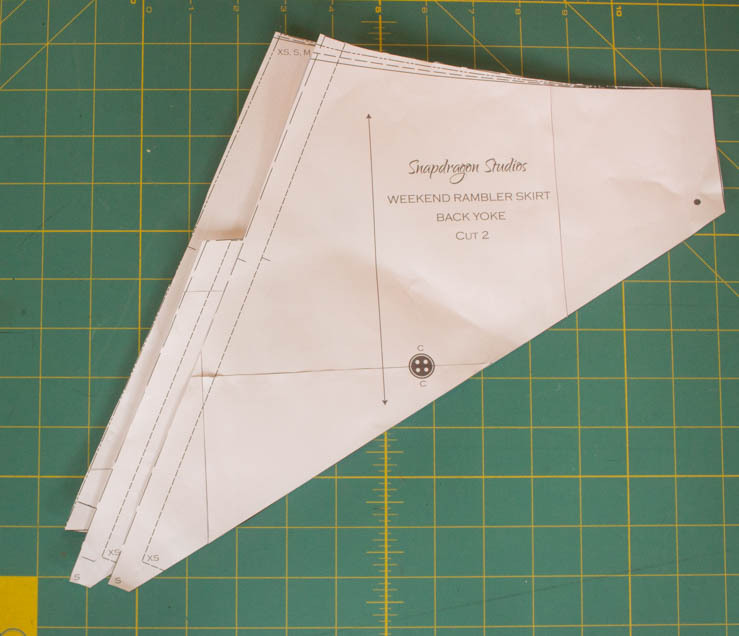 Have you ever sewn a Snapdragon Studios design? 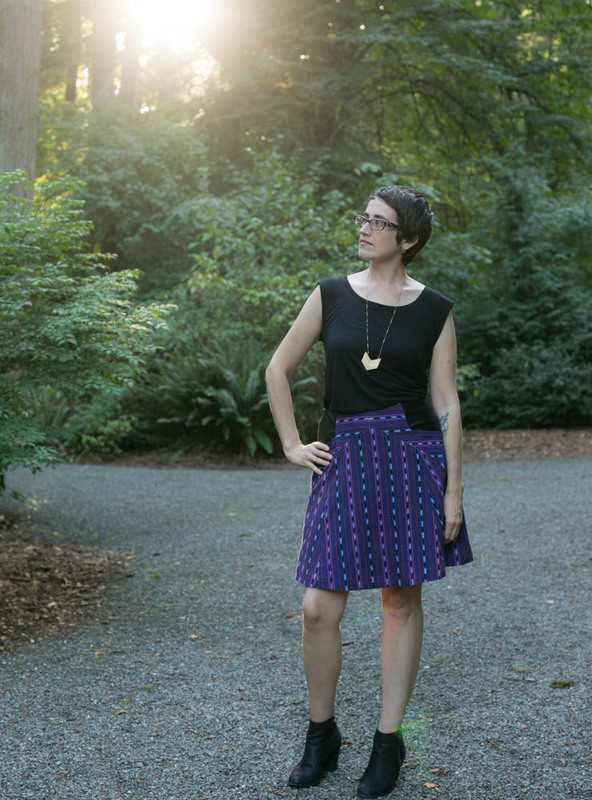 Have you made the Weekend Rambler Skirt? I’d love to hear what you think of this pattern. And yay for indie designers! !